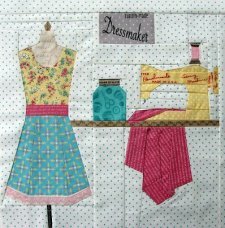 Celebrate your passion for sewing with this adorable Dressmaker Quilt Block designed by Charise Randall as part of the Sew Out Loud Quilt Along. This fun block, accented by strong vertical and horizontal background quilt stitches, is the perfect way to use some of your favorite fabric stash pieces. We love the fine details like the pink lace at the bottom of the skirt, the fabric notion pattern used for the jar and her signature wall-sign. 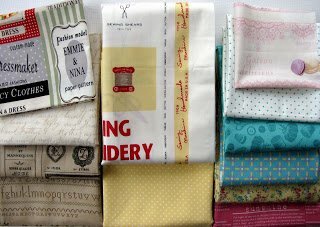 Check out some of her other designs that also feature a variety of clever signs and labels.